Should have realized they were gonna join in the ‘fun’ on “Friday Of The Single Demand”. Tens of thousands of residents of Gaza took part on Friday in a rally in which they called to save Jerusalem from its “Judaization” (ie the settling of Jews in their capital) by Israel. 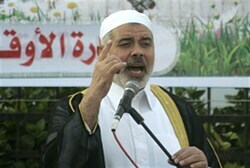 The procession was organized by the Hamas terror group and similar rallies were held in other Arab countries. The main procession in Gaza started at the Al-Omari mosque immediately after Friday prayers. The marchers later arrived at Palestine Square, where a rally was held with the participation of Hamas’ prime minister Ismail Haniyeh, Deputy Parliament Speaker Ahmed Bahar (Hamas), and other parliament members and public figures. “When we say that we agree to a state within the 1967 borders (1949 armistice line –ed.) with its capital in Jerusalem, our intention is contingent on non-recognition of the Israeli entity and on the return of refugees,” Haniyeh said. Israel could have removed a nice-size chunk of problems today. Egypt: Israeli Ambassador Welcome Any Time. This entry was posted on Friday, November 25th, 2011 at 16:24 and is filed under Main Postings. You can follow any responses to this entry through the RSS 2.0 feed. You can leave a response, or trackback from your own site.